Property 1: The Spruce Hus - Studio by the lake. One bedroom apartment with lake views! 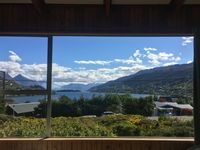 Property 37: One bedroom apartment with lake views! Frankton HOT TUB!!! - Location is Everything! Property 40: Frankton HOT TUB!!! - Location is Everything! 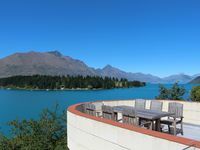 Close to airport, great walks along lake, also Frankton shops close. The location is outstanding being on the lakes edge. The huge deck has views right down the lake. The walking trail to Queenstown is at the bottom of the garden - very do-able for a mornings walk - and there are trees framing the property so it feels private. We loved the open plan nature of the living areas, the quirkiness of the colours and styling, and the spaciousness of an older property with some character. The driveway and parking was a bit of a challenge with our large rental SUV.